There are actually two hotels at the Cavalier Hotel in Virginia Beach VA. One is a modern hotel on the beach, and the other is a historic hotel on a hill a few hundred yards back from the beach. The old hotel opened in 1927 and offers a truly different vacation experience. Seven U.S. Presidents have stayed at the hotel. 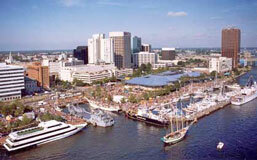 400 guest rooms total make the Cavalier Hotel one of the largest in Virginia Beach. Amenities include Indoor and outdoor olympic-size pools, a health club, clay tennis courts, and croquet lawn. Camp Cavalier and Kids Cafe for children. The Cavalier has five restaurants: The Pocahontas Dining Room, The Sand Dollar, Dolphin Lounge, The Breezeway Cafe, and The Hunt Room Grill. Room service is available. 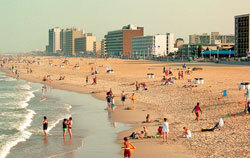 The Cavalier Hotel is located in Virginia Beach, Virginia on the oceanfront, at 42nd Street and Atlantic Avenue. It's at the northern end of the beach, which is quieter and less hectic than further south.